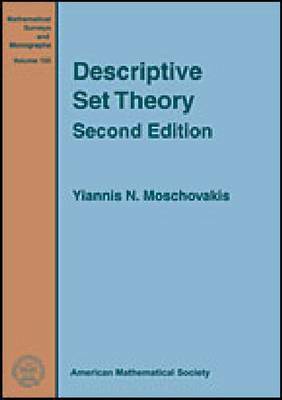 Descriptive Set Theory is the study of sets in separable, complete metric spaces that can be defined (or constructed), and so can be expected to have special properties not enjoyed by arbitrary pointsets. This subject was started by the French analysts at the turn of the 20th century, most prominently Lebesgue, and, initially, was concerned primarily with establishing regularity properties of Borel and Lebesgue measurable functions, and analytic, coanalytic, and projective sets. Its rapid development came to a halt in the late 1930s, primarily because it bumped against problems which were independent of classical axiomatic set theory. The field became very active again in the 1960s, with the introduction of strong set-theoretic hypotheses and methods from logic (especially recursion theory), which revolutionized it. This monograph develops Descriptive Set Theory systematically, from its classical roots to the modern 'effective' theory and the consequences of strong (especially determinacy) hypotheses. The book emphasizes the foundations of the subject, and it sets the stage for the dramatic results (established since the 1980s) relating large cardinals and determinacy or allowing applications of Descriptive Set Theory to classical mathematics. The book includes all the necessary background from (advanced) set theory, logic and recursion theory.